PUBLICATION INFORMATION Ad Astra is published three times a year by Ruamrudee International School. Its objective is to report on happenings at Ruamrudee International School. At least 1,300 copies are printed per issue and sent directly to all students and their families. 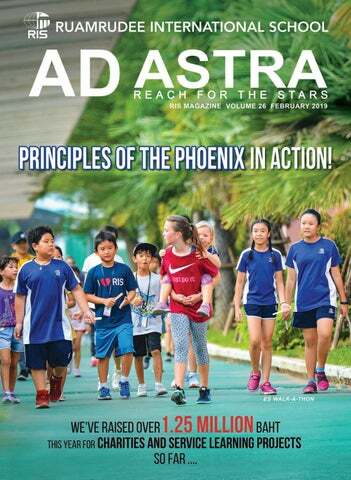 Ad Astra is also distributed among our faculty and staff and is published on the school website. The RIS family is a large and growing community of international citizens. s School Chaplain, my desire is always to foster the spirit of Ruamrudee International School. The heart is very important for the spirit, and in order to be worthy people, our students need to have the right spirit to make progress in the future, otherwise everything is done for their individual advancement, in other words, focusing on what’s good for them. One of the wonderful things we do so well at this school is nurturing that spirit by reaching out to help others. From the very beginning of the school in 1957, the Sisters from Malaysia realized that we needed to help the poor in our local communities. The Sisters would travel along the tributaries of the river to find the huts of the poor people. Sometimes our students went with them to see how they could help. They noticed that most of the people didn’t have pots and pans and that the children needed more clothes. They made sure to find things that the people along the river could actually use and brought these things to them. Through their help, they were embodying the spirit of caring. This spirit developed dramatically when we moved to our campus in Minburi. We began a separate department for Religion and Values, and that has become the department that oversees the development of the spirit and values of the children. We currently have lots of teachers, including our two Sisters from the Philippines (Sr. Gladys and Sr. Micah), as well as Mr. Jaffereli, who teach and model good values for the children. A group of our students recently went to Chiang Mai because they heard that one village had no water. They looked for ways to support a program to supply clean water and raised funds for a couple of years. Now the system is up and working and the people of the village are able to drink clean water. That’s the spirit of reaching out to people in need. We also have many other programs that prompt our students and community members to help others, like the Blood Drive and the Give Care, Give Hair programs. These are beautiful gestures of caring and they are so easy to do. These are just a few examples, but they show the spirit of RIS and are all done for a good purpose, which is to nurture our students’ sense of empathy so that in the future, when they become important people, such as doctors, lawyers, teachers, etc., they don’t just sit behind their desks but they will always remember to be thankful and to reach out to people in their neighborhoods and give them help and glimpses of happiness. We want our students to have this spirit of giving, of helping people other than ourselves so they are also able to live a decent and happy life. I’m very pleased that our teachers and students still nurture this beautiful spirit, which we have preserved for so many years. And I’m thankful that RIS teaches our students to have a good and open heart for people in need. Thank you very much. God Bless You! Lin that the students were able to come up with an ending; they realized that the lonely yellow dragon we kept talking about was probably the New Year’s dragon waiting to be brought in. Finally, what is a learning process without a celebration and presentation of learning? So we put on a show! We put on three theatrical performances and invited parents and classes from PreK 2–grade 5 to attend. Theater performances allow for a voice that honors the actions and thoughts of the whole class, even those who don’t speak the language or those who don’t feel comfortable participating in large-group discussions. Performances especially allow for a space to explore roles and personas that students might not otherwise feel comfortable using unless on stage. I went to one of the ES wai khru ceremonies and was immediately struck by the solemnity of the event and how conscientiously the students performed their roles and tasks. Their behavior was very respectful and they had evidently practiced a lot beforehand. Many parents attended the ceremony and were also recognized and honored as being important in the children’s lives as their first teachers. A few courageous students sang the wai khru chant in Thai while rest of the children repeated phrases in unison, for a powerful effect. The chant was then translated into English, and I caught phrases such as “honor teachers… pay endless respect...hard work and wisdom...lead students to acquire values...succeed in their endeavors…” The students then approached the teachers on their knees to present their flower garlands. The teachers and administrators were visibly moved by the expressions of thanks and showering of appreciation. his semester, the second grade has been investigating lots of different insects during their science classes. They have learned all about the body structures of mealworms, caterpillars, and silkworm moths. Additionally, our students have witnessed the life cycles of these bugs from egg to adult. Students cared for the insects as the bugs ate their way through their eggs, devoured leaves as larvae, and metamorphosed into their adult forms. As a culminating project to demonstrate their learning, the second graders were challenged to design their own insect (real or imaginary) out of recyclable materials. We invited all of the elementary students and teachers to vote for their favorites. Students from all grade levels participated in the action, and the winners are in! worked on Tree Line Projects after they had studied and been inspired by Vincent Van Gogh’s paintings of trees. According to Ms. Robin, the intention was to give these students an opportunity to “create their own unique tree pictures using the drawing technique of repeating lines to create movement while exploring different materials in the drawing center, such as pencils, colored pencils, crayons, oil pastels, pens, and markers.” The 1st through 5th grade students, meanwhile, were learning to become authentic artists by starting with an idea and progressing to a finished product. Because everyone works at different speeds and has different goals for their work, what ended up being on display were some completed projects but also some “works in progress.” Students were given the opportunity to use any of the art tools, materials, and resources while choosing the technique(s) and subject matter for their final work. The 1st graders chose from the drawing, painting, or sculpture art centers, and the 2nd graders chose from the painting, collage, or fiber arts centers. The 3rd, 4th, and 5th graders were able to choose from any of the six art centers: ceramics, drawing, painting, sculpture, fiber arts, or collage. The entire show was an impressive display of our younger students’ art and a great way to see and understand the amount of work and practice that needs to take place before a piece of art is considered “final.” As with so many things in life, so much of the learning and experience is through the process. The end result is just part of the journey. Special thanks to Ms. Robin and Mr. Owen for all of their work and extra time required to plan and present an art exhibition. If you didn’t get to attend the show, here are some samples of the students’ artwork. The next ES Art Show is coming up: April 1–28—mark your calendars! he Japanese Cultural Festival was held in the High School on November 9, 2018. Many students, teachers, and staff came to the HS breezeway during lunchtime to enjoy several aspects of Japanese culture. Thanks to a lot of support from the RIS community, we raised 16,753 baht from the Japanese food sale. All of the proceeds were donated to the city of HIROSHIMA for the preservation of the A-bomb Dome. Here are some comments from our students about the experience. ust before the Christmas break, RIS had a rousing assembly to celebrate and honor our many student athletes who participated in Season 1 RIS sports. From our youngest players on the many U11 teams to our seasoned Varsity athletes, all of the Season 1 sports teams were honored as they were introduced. Each team paraded through the center of Godbout Hall to the enthusiastic cheering and clapping of the rest of the school community. Mr. Todd was a passionate emcee whose energy and excitement generated a palpable buzz of team spirit. Although he was almost outdone by our vibrant and colorful mascot, the Phoenix, who really got the crowd going with his larger-than-life antics. Our talented HS Jazz Band, directed by Ms. Claudia, played the first few songs as the U11 girls and boys basketball teams made the inaugural entrance, running down the center aisle with a few theatrics thrown in. Next up were the U13 boys and girls tennis and basketball teams, followed by the U15 girls and boys basketball teams, who made a more casual entrance (because, you know, theyâ&#x20AC;&#x2122;re teenagers), but they also received a rousing applause. The Junior Varsity boys and girls volleyball and soccer teams came next. Hot on their heels was the Varsity boys and girls cross-country and soccer teams. Our Varsity boys soccer team were runnersup in the SEASAC championships. We also learned that a few of our JV and Varsity team members are still in middle school, so these student athletes have a bright future ahead of them. The penultimate group to be celebrated was the Varsity boys volleyball team. They placed 2nd at BISAC and SEASAC. They were also awarded the highly coveted Best Sportsmanship award at SEASAC. The final team to be celebrated was the Varsity girls volleyball. These committed and talented players won 1st place at both BISAC and SEASAC! After each team reached the front of Godbout Hall, they gathered on the stage with their respective team members. By the end of the assembly, there was an impressively large group of RIS student athletes gathered with their dedicated and hard-working coaches. Mr. Todd thanked all of the athletes, coaches, and parents for their support and cheerleading. Hereâ&#x20AC;&#x2122;s to a great second season of sports at RIS! he much-anticipated annual RIS ES Christmas Show, “Our Christmas Gift,” took place on Friday, December 14th. Every student in the Elementary School, from PreK 2 through grade 5, took part in the show, which was performed in front of such a large audience of parents, family members, fellow students, and faculty that literally no one else could be squeezed into the PAC! The show opened with Thailand’s Royal Anthem followed by opening remarks and a blessing from Fr. Travis. Each song was introduced by well-dressed and highly poised emcees, all of whom had memorized and practiced their lines and delivered them with confidence and flair. Grades 1–5 performed their own songs, while our youngest students in PreK 2–KG performed a song all together. Each song was the epitome of a production, complete with choreography and outfits that matched the song’s theme. his year the ES had two Games Days: one just for the PreK and Kindergarten students on Friday, January 18, and a separate day for our students in grades 1–5 on Thursday, January 24. It was the first year we tried a “carnival style” Games Day, where each student was given a “passport”—a laminated card that they took to each station to be checked off by an adult. They could take a maximum of 3 turns at each station. Students who finished their passports (visited every station) were eligible for a prize. Prizes included extra recess time, lunch with the ES Principal or PE teachers, a variety of art supplies, some toys, and—of course—sparkly slime! The students loved the freedom of movement and being able to go to the different stations with their friends. Several of the stations were very popular, the dunk station in particular! Mr. Dan, Mr. Matt, and Ms. Cris O’Malley all volunteered and were dunked several times, much to the students’ delight. The Tropical Slip n’ Slide was another big favorite and got faster and faster as the day went on. In an effort to be eco-friendly, students brought their water bottles with them instead of generating a lot of plastic waste. Thanks to all the staff who organized in advance and to the many helpers on both days who worked to make sure that everything ran smoothly. Both days were hugely successful: the kids had a lot of fun while getting plenty of exercise. n December, the Redeemer Cafe hosted a book launch party for the new RIS Literary Review, Word/Play. The small cafe stage was set up with microphones, creating an intimate and cozy yet inviting and open space. The newly published writers—all students in the first semester Creative Writing class—introduced themselves and read excerpts from original pieces written in a variety of different genres, including cliff-hanging horror stories, ode poems, screenplays, and dystopian stories. A few students performed a group reading of another student’s play, and several students took turns reading parts of a collaborative story. Many audience members, including fellow students, teachers, counselors, and administrators, reported being struck by the readers’ confidence and poise; it takes guts to perform in front of an audience, especially when it’s your own work. At the reading, additional copies of the books were made available to the audience members, and each student took home their own copy of Word/Play. The idea to launch an RIS Literary Review developed from my desire for the Creative Writing students to see their hard work in print and to share their creativity with the RIS school community. As a former book editor myself, I know how rewarding it can be for authors to hold a printed book in their hands and see their names inside. When I approached the high school administrators about the idea, Mr. Jim and Ms. Sara immediately said yes, and suggested that I work with the Ad Astra team to help with the book design and publishing process. Ms. Elisia, who agreed to be our editor and production coordinator, was just as excited as I was, immediately seeing the value, both pedagogically and personally, in having the students experience the publishing process and ultimately see their work in print. Since we both have professional experience in the publishing industry, we knew the work involved in producing a book and were looking forward to sharing that creative process with the students. The Creative Writing students not only wrote the creative content of the book but were also involved in many of the steps in the publishing process, including selection of texts and images, editing, design, and marketing. In early meetings, students generated suggestions for the interior design and layout, which were shared with Mr. John, our brilliant book designer, and they decided what content they wanted to include in the book. One student, Tim, suggested that we create a “shared story” in the style of the writing game “exquisite corpse,” where each student contributes a section of the text. The class embraced this idea, collaborated to choose a setting and original characters, and even voted on several key plot points as the story, “Hectic Holidays,” developed. Later in the publishing process, students wrote their own author bios, added original photos or drawings to illustrate their writing pieces, and voted on the title and cover art, which was chosen from a selection of photos submitted by students in the class. workshops on topics within each of the three strands. The team made sure the range of topics were applicable to all three sections—ES, MS, and HS—so there would be content relevant to all the teachers attending. Orchestrating a successful conference requires a lot of planning ahead, coordinating logistics, and consideration of multiple details. Among other things, the team had to build a website, organize hotels and shuttle buses, create and design registration forms, arrange for food and snacks, purchase gifts and prizes, and secure sponsors. RIS was proud to be one of the sponsors of the conference, along with WIDA, EARCOS, Boonrawd Brewery Co. Ltd, Home Fresh, and the guest speaker herself, Andrea Honigsfeld. One of the ways the team managed and oversaw the conference was by purchasing an event app called Whova. All of the conference details were uploaded to the app so attendees could read about the sessions and workshop descriptions, select and enroll in the workshops they wanted to attend, and check in upon arrival. All communication was done through the app during the conference itself. Guests could even create and comment on any conference-related topic discussion board, and the organizers could check attendance and post announcements. Andrea, and a wireless printer that connects to a phone to print pictures. The first prize was a ticket to a WIDA workshop! An extra-special mention goes to the 21 RIS students who volunteered their time over two days to make more than 1,000 desserts—including cheesecake, oreo mousse, brownies, and cookies— for the guests. ur 10th grade history students recently took part in a trench warfare battle simulation on Godbout field. The exercise, called Power and Pride, was designed to simulate the mass slaughter that took place during World War I. The classes were divided into two alliances comprising teams of fictional countries that fought against each other. Each group was supplied with ammunition (water balloons, water guns, and wet sponges) that they used in a battle to take over the other countries on the field. was better protected. The intended outcome of this battle was a stalemate, where most students were “eliminated” during battle. The ultimate goal was for the students to gain a better understanding of the harsh reality that no one really “wins” in war. n December 18th, the last day of school before the Christmas break, Middle School students and teachers gathered in Godbout Hall for the annual MS Knowledge Bowl. Dressed in holiday, um, attire… Mr. Kevin and Mr. Felix were the lively emcees for the event, which featured two rounds of a Jeopardy-style quiz along with a series of themed challenges. The challenges ranged from fun PE-based activities, such as using straws to suction ping pong balls and drop them into a basket, to name-that-movie and name-thattune games, to a final series of tricky questions that revealed how well the students “know their teachers.” It was a close competition, but ultimately the Cobras beat the Tigers by a mere 20 points to claim first place. Representatives from each of the six MS House Teams— the Golden Gibbons, Pink Elephants, Black Bears, Emerald Cobras, Titanium Tigers, and Blue Hornbills— were on stage to answer the challenging questions, which included topics such as Thai culture, sports, arts, and social studies. At the end of the round, the students were given one Final Jeopardy question on which they could wager up to 600 house team points! determined by MSC representatives. Each round went for 2 minutes, one of which judged the teachers on their enthusiasm, creativity, and energy. Itâ&#x20AC;&#x2122;s safe to say, there was plenty of that! But the final champion was Mr. Kevin in his outlandish Christmas suit, who secured his victory by busting out some impressive Fortnight dances. There was one final danceoff between a group of students and a very tired Mr. Kevin. The judges couldnâ&#x20AC;&#x2122;t decide who was better and declared a tie. The final House Point standings were: Hornbills: 1,462 Bears: 1,620 Elephants: 1,912 Cobras: 1,960 Gibbons: 1,978 Titanium Tigers: 2,227 (making them the Semester One Champs!) But the true victory of the day was the money collected for the Camillian Home. The danceoff raised a total of 15,700 baht, which goes to care for orphaned and abandoned children with special needs. What a fantastic way to end the first semester! t was a steamy Monday for January and clouded with haze for much of the day. But not even unfavorable elements could stand in the way of launching the RIS Phoenix Swim-a-Thon for the second year in a row. Now an annual fundraising event, this year saw more than 75 swimmers band together to exhibit the true meaning of Ruamrudee’s principles of “Head, Hand, and Heart.” The RIS Swim team completed a marathon innings of two hours in the water, counting each and every lap in attempt to raise as much money as possible for the Baan Nok Khamin project in Uthai Thani—a highly respected charity for underprivileged orphans. Initially, our goal was to raise 50,000 baht, which would help to pay the construction costs for self-sustainable projects in the orphanage, such as chicken coops, a fish pond, and vegetable gardens. However, thanks to the efforts of our 75-plus swimmers and the support of the wider RIS community, we were able to raise an incredible sum: close to 310,000 baht! Each and every swimmer who participated in this event deserves to be applauded for their magnificent efforts. However, I do want to take this opportunity to highlight some outstanding individual performances: •	Jaye Ruh (a student from the RIS Swiss Section) swam over 250 laps and raised more than 44,000 baht! •	Newcomer Matt Napraprukchat (grade 11) collected 62,000 baht in sponsorships from his family and friends. • Bene Puengchanchaikul (grade 5) raised over 25,000 baht. •	And our youngest swimmers, first-graders Nina Chiaranaipanich and Pleng Tuaycharoen, combined their efforts to swim more than 25 laps … and they are just 6 years old! Very well done, swimmers! Our school community could not be more proud of the efforts you’ve shown in trying to make this world a better place through a union of hearts! by Elisia Brodeur pink, Class of 2020 — red and yellow, and Class of 2019 — green and blue. The Knowledge Bowl was, as always, a sensational display of imaginative themes, magnificent stage displays, striking costumes, and outstanding performances. This year’s themes were The Galaxy (Freshmen), Ancient Egypt (Sophomores), The Greatest Showman (Juniors), and The Hidden Kingdom (Seniors). Each team of teachers who represented their respective Classes made an elaborate entrance before taking to the stage for their round of jeopardy-style questions on such topics as capitals of nations, artists’ names, cartoon characters, and general trivia. Our teachers were whip-smart and lightning quick with their answers. That was followed by each group of Class representatives making their entrance into Godbout preceded by dazzling choreographed dances, gymnastics, music, lights, and props. By the time the seniors took to the stage, the room was buzzing with boisterous energy. This year saw the introduction of a new element to the Knowledge Bowl called Helping Hands. The student reps had a lucky draw to see which of the Helping Hand strategies they could use, ranging from “phone a teacher” to “doubling the points” for an answer. After a bumpy start because of some technical glitches, the teams took turns dominating the different categories. After some controversy, the seniors were ultimately declared the winners. Here are the final points: Freshmen: 2,100 Sophomores: 800 Juniors: 2,050 Seniors: 2,700 Congratulations to all the participants and planning crews for another impressive and memorable High School Knowledge Bowl! by Sariya (Ahya) Angeles-Ahmed, Grade 4-3 people who are not as lucky as us. It was a day of working together as a team and showing respect to each other and most especially to God. We learned this from the activity shared with us by Sr. Micah. We also learned to respect God and to give Him all our thanks. The short videos shared by Fr. David, our main speaker, taught us about kindness, happiness, and helped us realize the unconditional love our parents have for us. After the sharing, we received the Sacrament of Confession, asking God to forgive our shortcomings and to be determined to become good children, then we thank God in the Sacrament of the Holy Mass, which was presided over by Fr. John. Our day concluded at the Father’s house, where we were invited by a parent to have lunch. Since it was also Father Apisit’s birthday, we merrily sang him the Happy Birthday song and had a bountiful lunch together. It was a very meaningful and fun day that we spent with ourselves, with others, and, most especially, with God. This Recollection Day made us realize how important it is to be a good person by simply being kind, respectful, mindful, happy, and caring for each other. Not only did our understanding, connection, and respect toward God grow stronger, but we also became closer to God and to others. he Opening Reception of the IB Visual Arts Year 1 Exhibition “K” took place on Thursday, January 24, 2019, at St. Luke’s Gallery. The extraordinary artwork of the Year 1 IB Visual Arts students—Jew, Ryu, Maple, Jinny, Pun, Jay, Nat, Lily, Okie, Menthol, and Seang Proh—was on display, along with their thoughtful, and often thought-provoking, Artist Statements that described the thinking and feeling behind each piece, the message they wanted to convey, the artist(s) who inspired them, and why they chose that particular medium. Several faculty members, parents, and fellow classmates came to see the talented students’ work and to enjoy some tasty refreshments. Have a look for yourself! that can be intentionally and carefully nurtured. Teachers will implement the curriculum through keen observation and ongoing reflection of the children’s interests and needs. With a foundation built on the Reggio Emilia Approach, our highly experienced and qualified faculty will facilitate learning through an experiential educational approach. The children will learn and create using their senses, thereby harnessing their intrinsic curiosity and planting the seeds for future academic success at the RIS Minburi Campus. “The ultimate goal for RIS Early Years Campus,” according to Fr. Apisit Kritsaralam, RIS School Director, “is to ensure a safe, inclusive setting where the strengths and needs of the youngest members of our school community are recognized and where memorable beginnings are crafted.” Under the aegis of the RIS Leadership Team, an education at RISE will mirror the blueprint of its mother campus in Minburi with its robust curriculum and high standards of education. Also present at the signing ceremony were Fr. Meechai Udomdej, Mr. Dan Smith (RIS Head of School), Mr. James O’Malley (HS Principal), Mr. Joshua Fritts (ES Principal), and Ms. Jessica Seim (ES Assistant Principal). The launch was well attended by more than 250 guests including prospective parents, students, alumni, Redemptorist Fathers, teachers, distinguished guests, administrators, and staff. The event was made even more special with the presence of RIS alumni from all walks of life who provided glimpses into the school’s past with stories that highlighted over 60 years of RIS’s colorful history as a proud institution. Entertainment was provided by some of our current ES students along with a special performance by alumni Michael Sawatsewi and Debbie Scott Klongtruadroke, both from the Class of ’96. The afternoon was an affirmation of our strong community, one that exemplified the meaning of Ruamrudee: a union of hearts. be notified of their child’s condition along with the recommended course of action to resolve the issue. Eyesaver is ready to take action but needs sponsorship to be fully initiated. Each school will require one screening kit, which can test approximately 400 students. Each kit costs around 200 baht (including shipping). A donation of 200 baht can save 400 children from future hardships they might have to endure. Corporations who sponsor 10,000 baht or more will appear on the kit and will be thanked in Eyesaver conferences and workshops held throughout Thailand. If any parent is reading this and is willing to offer a donation, please contact me by email: kritinv20@rism.ac.th or phone: 096 942 5093. Thank you in advance for your support! n Saturday, February 2nd, Phoenix 1, Ruamrudee International School’s VEX team, took part in the Thailand VEX Robotics Competition, which was held at NIST. The VEX Robotics Competition is the most demanding and competitive robotics competition in the world, and the fact RIS is competing at this level and against other top schools after only two years is a real testament to our students’ abilities and determination. To prepare for the competition, team members worked together to design and build a semi-autonomous robot that can maneuver around obstacles and solve challenges. While working together, the students are also learning and practicing an equally important set of skills: creativity, collaboration, strategic thinking, problem solving, and perseverance. The RIS team made it to the finals after a thrilling semifinal—a draw of 17-17—and then a win in the rematch. The RIS team lost in the final match, securing second place overall. Not only did our team make it to the finals but they won the prestigious Design Award. This award is given to the team that has the best robot design as determined by their engineering notebook that details their design process and an interview with the judges. by Elisia Brodeur What happened after that? I started to work with Ms. Kun, one of the senior Pastry Chefs in the restaurant. She ultimately became my cooking teacher. I started by reading old cookbooks. The first thing I cooked was a simple carbonara dish. How did MasterChef Junior come about? My dad asked me if I wanted to apply to MasterChef Junior. He explained that it would be quite a bit of pressure. I decided that I was OK with that, so I decided to audition. How did you get onto the show? The first round was a video of me cooking. I made carbonara with flaming cheese on top and a panna cotta with strawberry sauce. I was invited to the next round of auditions. For that, I made creme brulee and jam ahead of time and did the decorations live at the audition. arlier this year, I talked with KC, a 3rd grader in Ms. Cris’s class, to find out how this 8-year-old chef earned a place as a contestant on the popular TV show: MasterChef Junior Thailand, a competitive cooking game show series adapted from the British show, Junior MasterChef. MasterChef Junior Thailand airs on Ch7HD (35) Sundays at 6:20 p.m. More than 2,000 children from all over the country applied for a coveted spot on the show. Forty children were selected to be on the show, and only 26 of them got their MasterChef Apron. How long have you been at RIS? For 3 years, since 1st grade. How long have you been interested in cooking? Since I was 4 years old. What got you interested in cooking? My family owns a restaurant, Jitpochana Park, which serves good Thai food. I would sit in the kitchen and watch the cooks work. Then I started to wonder if I could cook, too. At first I helped in the bakery, making tarts, creams, and creme brulee. I also made my own butter and cream. called Hotate with Wasabi Sabayon, and I had only one week to practice making it. How did you calm your nerves? I practiced meditation and ways to breathe that would calm my nerves. I also did singing therapy and worked with RIS alumna Maleewan. How did the filming work for the show? Each episode took most of a whole day to produce. There were two weeks between each taping session so we had two weeks to practice. How far did you get and what did you make while on the show? I made it to the sixth episode then I had to withdraw because I was not feeling very well that day. I got to make hotate, risotto, cupcakes, nam prik ong, and take part in two team challenges where I got to work with the other Junior MasterChefs. For the first team challenge we made pork chops, which was hard. We also had an Infinity Choice, which included ostrich, frog, and crocodile. I won best dish for my Crocodile menu, which I put in the pressure cooker because if you don’t cook it well it tastes like rubber. Tell me more about the team challenges. I learned from the first team challenge that we needed to be organized. For the second team challenge, I got to be the Team Captain for the Blue Team. We went to the Cartoon Network Waterpark in Pattaya and had to serve fast food to all of the people visiting the park that day. I believe that fast food and fine dining go together, so we made guacamole because it is filling and it’s good for you. What’s your secret to making really good guacamole? You need to scrape out all of the avocado especially the part nearest the skin because that is the tastiest part. But the real secret is in the seasoning, but I can’t tell you what it is because it’s a secret! What is your biggest take away from the experience? Friendships, both here at school and with the other MasterChef Junior competitors. I met up with all of the MasterChef Junior kids in December. We got to swim, cook, and play Bingo. n December 22, 2018, our very talented 6th grader Siri (Mac) Chaikul had the distinct honor of competing in an international vocal competition in New York at none other than Carnegie Hall. The competition, organized by American Protégé, is an “International Vocal Competition...designed for singers who would like to challenge themselves in a very competitive environment. The competition is open to solo vocalists and vocal groups of all ages, nationalities, and countries,” according to their website. We are delighted to report that Mac was awarded First Place in the Broadway/Musical Theatre Repertoire Category (for Juniors, age 11–14), “for the extraordinary dedication and achievement in the field of music performance.” Not only did he earn that coveted prize but Mac also received the Judges’ Distinction Award, which is given to only 6 outstanding participants from the entire competition, across all age groups, and from all over the world. Well done, Mac! Here is a video that Mac put together—and edited— that features a recording of him singing at Carnegie Hall with a compilation of photos from the event: https://bit.ly/2VtIqpf I recently talked with Mac’s dad to find out a bit more about how this prestigious opportunity came about. How did Mac come to participate in this competition? Mac has won several prizes over the last year, including a spot in the Bangkok Symphony Orchestra during their talent search and first place in the Singapore Lyric Opera ASEAN Vocal Competition 2018. He also won the Gold Vocal Junior prize in the 6th Hong Kong International Youth Performance Arts Festival even though he didn’t attend in person because he was auditioning for something else at the time. Mac decided to audition for the American Protégé International Vocal Competition as it’s a huge honor to participate. He submitted a video of his performance at the BSO concert for his audition. This competition also gave him the chance to visit New York and, of course, to perform in Carnegie Hall. What did Mac think of performing at Carnegie Hall? Mac has heard a lot about Carnegie Hall; it’s a privilege for musicians to perform there—it’s as distinguished as the Royal Albert Hall in London! Mac was extremely proud to be able to perform in this very special venue where many well-known artists get to perform. It’s a great accolade that Mac got to sing there at just 12 years old! What do you think makes Mac’s performances so special? He just loves singing and performing, he loves to be on the stage. He transforms into a totally different person— it’s like he truly comes alive. His goal is to engage with the audience and make them happy, which he does. What else did Mac enjoy about New York? It was Mac’s first time to the States and the first time there for our family as a whole. Mac loved New York! We got to see the Broadway musicals Frozen and Wicked. Mac also wanted to see Aladdin but we ran out of time. He was so impressed by the live performances. He actually wanted to stay in New York and audition for musicals but we explained that he needs to finish his education first! What is Mac working on right now? He’s practicing and concentrating on his singing, mostly songs from musicals, classical pieces, and Thai songs. He has 4 or 5 voice teachers because we’ve come to understand that the voice is an instrument that has different ranges of voice and tones; it’s different for each artist. So Mac needs to learn how to use proper breathing techniques and singing styles that suit his voice. How much does Mac practice? Most days he practices at least an hour, both singing and playing the piano. According to his teachers, the best singers also need to know how to play the piano. Sometimes his practice is less formal, like when he sings along with YouTube videos, but it’s just as useful because it helps him to improvise. What’s next for Mac? He has auditioned for something but we can’t say what that is just yet. Let’s just say that you will be seeing Mac perform publicly in the near future… Watch this space! he Association for Music in International Schools, or AMIS for short, hosted the “Asian Middle School Honor Band” at the Shanghai American School (Pudong Campus) on January 23–27, 2019. This was one of 17 events organized by AMIS for the 2018–2019 school year and the 20th annual AMIS Middle School Honor Band Festival— the first was held at The American School in Paris in 1999. The purpose of this honor band is to gather talented band instrumentalists in grades 7 and 8 to give them the opportunity to work together as a concert band with guest conductors from within the international community. Places in the band are determined by auditions that are judged “blindly” (no name or other identifying information is attached to the audio recording) by international school band teachers who are members of AMIS. “You’ve Got a Friend in Me” from Toy Story. We also played “Chasing Sunlight,” “Looking at the Stars,” “March Militaire,” and “Earth Dance.” What did you learn about being in band that you didn’t know before this experience? I learned that we have to be aware of everything around us: the conductor, our friends, the audience…. All of it. Also that musicians need to make adjustments as we play, without being told. Will you audition again next year? Yes, for sure! Ms. Claudia tells me that the song you played the solo on was a very “different” piece that included “neon plastic whirlies.” Tell me more about that! Yes, the whirlies make a distinctive sound. The song was called “Whirlwind.” Everyone in the band played 5 notes in a repeating pattern. When the conductor asked who wanted to do a solo, I volunteered. I had to audition on the spot, in front of the rest of the band. The first 2–3 notes were a bit shaky because I was nervous, but then my confidence grew and I was able to finish the audition and was chosen to do the solo. How do think Ms. Claudia prepared you for this experience? Since I joined band at the beginning of middle school, it’s been easy for me to be on the stage and not be scared. Also, every Christmas and end of the school year we have one concert, so I felt prepared for this event. For the trombones, Ms. Claudia gave us some techniques that made us sound better, one of those is the habit of sitting up tall. Do you want to share anything else about the festival? I was grateful to get to play in the band. The overall experience was thrilling as I got to work with other musicians who are at different levels. It was very exciting to meet new friends and learn about the Chinese culture. How often do you practice? I practice almost every day, for about 30–60 minutes all together. I really wanted to play the trombone, so I was determined to be good at it. What other instruments do you play? I also play the piano and I’d like to try a new instrument, a woodwind instrument, maybe the flute or the oboe. How long have you been playing the piano? Since I was 4 years old. I just reached Grade 7. * * After this interview, I learned—quite by chance— that Phoom didn’t just “reach Grade 7,” he actually earned the highest score—96/100—in Thailand for the Trinity Piano Grade 7 Exam 2018. There is a ceremony in Bangkok in early March to acknowledge “the three highest scorers in each grade.” As if that weren’t enough, I also found out that Phoom recently took part in the 5th Trinity College London National Youth Piano Competition, Thailand 2018. Actually, he didn’t merely take part in it, he won 1st place and Best Compulsory Piece in Category III (under 16 years old), along with prize money totalling 35,000 baht! Congratulations on your many successes, Phoom! Moving forward, I suspect we’ll be hearing quite a bit more about your musical accomplishments. s I was searching for songs for our Elementary School Christmas Concert, I came across one song that, from the moment I heard it, I knew it had to be the song for our first finale (for students in grades 3, 4, and 5). “Christmas Wish” is a song about wishing for peace for all children in the world, not only at Christmas time but all the time. Being blessed to live in a place where there is no war, I realized that if our students were going to be able to sing this song with true understanding and empathy, they needed to understand what living in a war zone might be like. So I set about finding some short videos that showed children explaining what their lives are like in the war zone they live in or had escaped from. I knew that when our students saw these videos of children talking about their shocking experiences that they would want to help. After researching aid organizations, I felt that that ‘War Child’ was the group that seemed to be doing the most to directly help children affected by war. I contacted ‘War Child, UK’ and then spoke with our ES Principal, Dr. Josh, and was given the green light to start fundraising. Most of our children were shocked to see the conditions that many children in war zones have to live in, and, as I expected, they were very keen to help. We decided to sell T-shirts that could be worn in the Christmas concert, have a toy sale, and also set up donation boxes around campus and in the PAC on the day of our concert. I also created an assignment that asked our students to reflect on the videos and to make a personal connection to the song “Christmas Wish.” They could create a poster, make a piece of art, write a poem, song, reflection, or persuasive piece about raising money, etc. I was overwhelmed by many of their comments, reflections, and artwork that they handed in. It was clear that our children feel deeply for the plight of children affected by war. Ms. Elisia, Ms. Jessica, Dr. Josh, and I worked together to design the T-shirt, and Ms. Shirley and Mr. Azeem helped with organizing and processing the orders. With the generosity of our parents and teachers we raised more than 115,000 baht from T-shirt sales alone! Mr. Olivier helped to organize a toy sale, which raised about 3,000 baht, and we had an additional 8,000 baht donation from RIS teachers. And from the donation boxes we collected a further 38,300 baht. WOW!!! videos are making the world a better place by helping the children who live in war zones, like the man who plays soccer with the kids and the man who brings toys to the kids. I feel sad about the people in war zones and wish I could help them. So I am happy that we will be helping them with the T-shirts and the donations. compete in championships in Asia. Minnie won yet more medals at this event: a silver for Freestyle 4 and two bronze, one each for Footwork Freestyle 4 and Artistic Freestyle 4. Minnie says that what she likes most about skating is the feeling of achievement when she accomplishes something, that sense of “I did it!” That’s what pushes her to learn more and get better. Minnie also enjoys the cool temperatures in the ice rink and says that the cold breeze in her hair feels good— especially when it’s really hot in Bangkok. extended leg in front). Minnie thinks that this spin “is hard and requires a lot of stretching to get the leg straight.” Clearly, she likes to challenge herself. But Minnie “likes to work toward small goals” so she can achieve them. She doesn’t want to make a huge goal because she feels that puts too much pressure on herself. When not skating, Minnie is involved in several activities at school; she’s a member of the Middle School Council and a delegate in the MUN. She’s also playing volleyball this season. She likes to “stay active and can’t stand sitting still.” This year Minnie plans to compete in Skate Asia, which will be held in Bangkok again. And next year her goal is to take part in the new National Youth Games for figure skaters in Thailand. We wish you the best of luck, Minnie! and me how to play Mahjong. We collectively collapsed on our beds as it hit curfew and slept like babies the moment our heads hit our pillows. help but stop to take photos of fungi to compete in the “fungal challenge,” where the team with most types of fungi wins. It was an unforgettable moment. Monday was the last day. We gave presentations on our fieldwork data. Coming back to school, Pleng and I couldn’t stop thinking about wanting to go back to the trip. It was the most memorable trip we’ve been on. The best part of the entire experience was the bonding. Not only between students, but between teachers and students. Even to this day, we reminisce about the trip and laugh over the countless memories, especially over our bruises from the grassland and the forest. While the purpose of the trip was to expand our research and ecological experience, I came back with stronger relationships with my friends and new relationships with my teammates. I would do anything to go back and relive that trip. It was, without a doubt, the best one I’ve been on. for the creation of their devised theatre work. It was there that the students learned about the Vietnamese people’s determination to survive and the ingenuity of the farmers and locals to create the longest tunnel system in the world. The students learned about the anguish of war and the hardships of living beneath the ground for years, enduring attacks from above. Many of the students crawled into some of the hiding spots in the forest floor and walked through the tunnels, which were dark and damp. This hands-on-learning greatly informed their final performances, which reflected on the struggles of battle, the need to protect family and community, as well as the shared stories and values of those on opposite sides of the conflict. At the festival, special workshops that included modern dance, Vietnamese drumming, and devised theatre practices, allowed the students to work in bright studio spaces and modern black-box theatres. These workshops, combined with their training in smaller ensembles (groups of theatre artists who practice, create, and perform together) created a rich experience for our students with lasting memories. We asked some of our students to reflect on what they took away from the festival so we can better appreciate the impact of this work on their development as artists and as global citizens. CLAUDIA LIU, Grade 12 Quote: “I felt like I belonged. I have never felt so much positivity in one place.” What was your favorite part of the festival and why? My favorite parts would be getting to work with new people from all over the world and the foods they provided for us at the festival. Here at RIS, we don’t get as much of an opportunity to bond with people from around the world so this experience was special as it allowed us to come out of our comfort zone and bond with people from a totally different culture. As for the food in Vietnam, it’s very high quality and well cooked—the taste, the flavor, everything! Just thinking about it makes me drool! What did you walk away with? What will you remember most? I walked away with a new perspective of theater and how to build a connection between the performer and the audience. I think I will remember most how in just a short amount of time we could create a beautiful theater performance. Would you recommend this festival to others? Who should try it? Yes, everyone is extremely positive and cheerful, it really lifted my spirits up. People who may feel like they don’t fit in with others at school. It will be a great experience for you to be able to break out of your comfort zone and just be yourself. ISTA will totally open a new door for you, it’ll be a great opportunity for you to come out of your shell and try something new without the fear of being judged. things. It reminded me of the phrase that “If you want something, you must go get it.” Would you recommend this festival to others? Who should try it? Yes! I would recommend this festival to other people for a variety of reasons: learning, friendship, and fun. I think that theatre kids, people who want to learn more about different cultures from a unique perspective, as well as people who want to try something outside of their comfort zone are the people who should try it. because before I realised it was happening, I had made friends with many people! Even now, I keep in contact with several of them on social media. I made a friend who creates music, just like I do. I befriended the contemporary dance teacher, a teacher from another international school, and my ISTA Artist Ensemble Mentor. I made a friend who, once we started talking, quickly bonded with me and my closest friends—there was an immediate knowing. Because this friend and I speak the same language, it allowed us to be creative together. We collaborated in a group setting and both shared the role of leader. We were like soulmates, like-spirits! I even got to understand the people who came with me from RIS—my own classmates and our performing art teachers—so much better as we chowed down on dinner and explored the city. The walks around Ho Chi Minh and the traveling together brought us closer, and to me, that is something very precious. I am always going to remember the people who taught me and the people I played with. ISTA is one of those important and special places where play is essential and play is freedom. I will remember the feelings I got from ISTA: the euphoria, the laughter, overcoming obstacles, etc. I will especially remember the panicked yet determined feeling I got when I entered the Cu Chi Tunnels and successfully got through the end in triumph. ISTA is a breath of fresh air and a place to call a home that always travels with you. Are you considering challenging yourself with a rigorous AP language course? Or is your child interested in taking an AP course? If so, you have come to the right place. While AP classes can seem intimidating and challenging for many students, it is worth looking beyond those concerns. As a student who has gone through an entire semester of AP English Language and Composition, my experience in the course has made me realize the perks and benefits of enrolling in this course. 1. Challenge yourself, be prepared for college English is the language of instruction in U.S. colleges; therefore, it is the foundation of all majors (e.g., computer science, lawyer, business) and your studies in the United States. If you ask any of the students enrolling in an AP English Language course, they would all agree that the course is very demanding. You will be tasked with writing many essays, taking extensive multiple-choice exams, and presenting a thoroughly researched speech analyzing another speech. Although this may sound like a negative aspect, it doesn’t have to be. The AP English course will foster you to step out of your comfort zone, develop critical-thinking skills, and learn effective time-management strategies necessary for success in college. Exposure to these challenges now will ensure that you will be able to handle collegelevel courses comfortably later. course can pay off and earn you college credits. Most U.S. colleges accept AP credits, and you may be able to skip some introductory English courses in college, saving you both time and money! In other words, this would give you the option to enroll in other elective courses, join a club, or participate in a sport. At the same time, according to the Business Insider article “Here’s What a Single Course Costs…,” you could also be saving yourself up to $6,000! 3. Impress colleges and strengthen your transcript College admissions officers are looking for students who can handle college-level courses. By taking an AP English Language course, you can stand out among a competitive pool of applicants. Since most international students applying to U.S. colleges consider English their second language, a challenging AP English Language course shows colleges that you are ready for their rigorous curriculum. In addition to appealing to elite universities, RIS offers a special weighting for students taking Advanced Placement and International Baccalaureate Higher Level courses— a 4.5 point scale. Essentially, you could be earning a higher GPA and strengthening your transcript if you give your maximum effort in such a course. his year we were very successful with integrating the school’s Principles of Phoenix of Heads, Hands, and Heart to show how we use our knowledge to become collaborative and resourceful students who help others in need. Besides supporting Fr. Ray’s Children’s Village, Camillian Home for Children Living with Disabilities, and Sarnelli House, we also continued with our diaper drive for the House of Hope in Nongkhai, assisting Mahathai Sueksa Tha Bom in Loei, Colors of Cambodia, and the Children’s Improvement Organization in Siem Reap, which takes care of orphaned and abandoned children. This year we also helped with an additional big project to help a smaller branch of Baan Nok Khamin, located in Uthai Thani, that takes care of nine boys. This year we promoted Global Goals #1 (No Poverty), #3 (Good Health & Well-Being), #4 (Quality Education), #9 (Innovation & Infrastructure), and #11 (Sustainable Communities) along with having fun, getting exercise, and building strength and endurance. We hope you enjoy reading about our students’ projects and accomplishments in this edition of Ad Astra. place behind the canteen for the students to wash their hands and brush their teeth. They were able to raise 15,000 baht and sent it to the school ahead of time for their project. When they arrived they spent an afternoon painting the area to make it more colorful and inviting. IS has been working with Baan Nok Kamin Foundation in Bangkok for several years now to help support the children there with the cost of school tuition, including education materials. Baan Nok Kamin is a private, nonprofit organization that helps and cares for orphans, street/homeless children, and drug addicts. When we found out that they also have a smaller branch in Uthai Thani that needed help, we were excited to help in any way we could. We found out that they own a small plot of land next to a local primary school and had built two mud houses to accommodate nine boys there. They also had a few chickens, two fish ponds, and a small garden in an effort to keep down their food costs. When we asked how we could help, they explained that they would like to have a real chicken coop or duck house so they could purchase more animals to raise who would produce eggs. They also wanted to fill the two ponds with fish so the fish would breed and multiply so they could eventually catch fish any time they wanted to. We also found out that they eat frogs and field mice to supplement their diet, so we discussed how we could build places to breed these animals instead of having to go out every day to catch them. We determined that we needed 50,000 baht to accomplish our goals. The Phoenix Swim Team graciously volunteered to help raise the money, while high school volunteers would actually go to Uthai Thani to spend a weekend helping to build the various items they needed. I was able to take 14 students with me for the weekend trip. Luckily, we were able to travel on a teacher’s in-service day, so we were able to spend half a day with the 9 boys and their classmates at the local primary school they attended. Two of our parents (Lobster and Ong’s mothers) sponsored lunch and ice cream for all the students, and we prepared some English activities and games for them. Then the next two days we worked really hard to build the duck house and an enclosure around one of the ponds and finish the field mice house that they had already started. We also ordered fish from a local fish farm and released them into one of the fish ponds. We even got the chance to go out into the nearby fields to help set the traps to catch some field mice. The best part was when our students found out they had to actually catch the ducks themselves once we had bought them. Although a little cautious at first, they all became experts at catching ducks in no time at all! A big thank you to Khun Tum from Human Resources and Khun Sunate from our Maintenance Department who also volunteered to go on the trip due to their skilled experience. Here’s what some of our HS volunteers had to say about the experience. he National Honor Society is an international organization that recognizes and encourages outstanding high school students who demonstrate excellence within the four pillars of scholarship, service, leadership, and character. The RIS chapter of the Society has long since branched off into several committees that coordinate various activities and services that build into each other and even go beyond our school. or narrowed down their course selection, time management, and other such insightful questions. This was rounded off with a Q&A session in which the sophomores— the intended audience—were able to inquire more about the seniors’ perspectives and reflections on their choices. During exam week, they also held a “Cookie and Cram” session at Griffith Library where students were not only able to review for upcoming exams but also to relax. On the other hand, the ES Capacity’s “Tie-dye and Stress Ball” activities were far more hands-on and assisted their fellow committees more directly. They taught elementary students about the importance of teamwork, creativity, and service, but the stress balls were later donated to the HS Capacity to help high school students to cope with the stress of exams. I feel that despite their different actions, the result was the same; they both gave insightful exposure to life both outside and inside school. They got the ball rolling for NHS inter-section cooperation. The Fundraising Committee used the ES Capacity’s stress balls and the HS Capacity’s cookies, as well as their own self-made charms, cards, and goodies, as care packages for stressed high school students during exam week. They also hosted the game Capture the Flag alongside a bake sale. The funds from both activities were donated to the Good Shepherd’s Orphanage, where another committee led efforts to establish and strengthen a productive relationship between RIS and the Good Shepherd’s Orphanage. The October trip to the Good Shepherd’s Orphanage consisted of three icebreaker activities (Virus, RedLight/ GreenLight, and 007 Bang) and a holiday activity (reindeer doll decorations). After all these efforts and hard work, the NHS—through the Appreciation Committee—dedicated themselves to a demonstration of their gratitude on International Thank You Day. They established a board of generic thank-you notes that students and teachers were able to take and relay to their peers. These notes were a beautiful expression of appreciation that circulated throughout our school—it was wonderful to see them fastened on people’s shirts, bags, water bottles, and other possessions. This cycle of cooperation, led by the dedicated students of NHS, has not only inspired similar scholarship in others but has also stimulated leadership, service, and commitment in our student body. This cooperation continues to strengthen character in our school. How do you think attending an international school like RIS helped you be an international student at a university abroad? I think language has been essential; being immersed and learning in English. At RIS there are many clubs and sports and activities, which is similar to college. The rigor of the IB program was a good segue to the rigor at Harvard. The research required for the IB Extended Essay was good preparation because research is emphasized at university and will be especially valuable for my senior thesis, which I plan to start working on next year. Is there anything about your experience(s) at RIS that you feel sets you apart or gives you an advantage over other Harvard students? At RIS, the volunteer activities and the opportunity to travel to other places gave me more experiences in seeing what’s out there, beyond university and cities and civilized parts of the world. Many of my friends at university have never seen those things. The experience of volunteering in rural areas has given me a different perspective. What do you miss about RIS? I miss the bonds and intimacy of the friendships I had at RIS. Many of my classmates had also been here since first grade, so that closeness was something I was used to. I also miss the level of accountability. What do you wish you had known before you arrived at Harvard? I wish I had known to bring warmer clothes and had been better prepared for the weather! Right now there is a 45 degree differential between Bangkok and Boston. Is there anything you really enjoy about Boston? I really love the variety of foods and the access to it. There are a couple of good, authentic Thai and ethnic restaurants nearby. I’ve been to a Harvard/Yale football game, which was pretty intense but had a lot of spirit. I also enjoy the colors of the leaves in the fall. What are your current interests and plans? I’m really interested in exploring the intersections of data science, humanities, healthcare, and pure data science. Thanks for your time, Todd. We look forward to seeing what you do next! hailand Tatler has been the nation’s leading lifestyle magazine since its inception in 1991, presenting an ever-engaging editorial mix of high-society profiles, glamorous events, lavish fashion shoots, and luxury lifestyle trends. The magazine recently unveiled its latest Generation T list, highlighting 50 of Thailand’s “brightest connectors, creative visionaries, influential innovators and disruptive talents.” To be featured in Tatler’s pages is a high honor. As a testament to RIS, several alumni have previously made the list, including restaurateur Chotipong Leenutaphong (Class of 2000), art curator Akapol Sudsana (Class of 1997), and music producer Montonn Jira (Class of 1996). This year, five RIS alumni are featured on the list of game-changing luminaries, some of whom also made the list the year before. Socialgiver, co-founded by Aliza in 2015, is an acclaimed social enterprise that enables users to enjoy lifestyle experiences while giving back. Businesses ranging from hotels, restaurants, experiences and more pledge GiveCards that offer Socialgiver users exclusive prices. Profits are donated to hand-picked social and environmental projects. The platform, featuring more than 200 brands, has recently been launched as a convenient mobile application. This synergy between people, businesses, and social projects has already helped more than 45,000 lives, allowing a sustainable means for customers and brands to make a positive social impact together. Beanspire Coffee, co-founded by Fuadi in 2013, aids Thai coffee farmers in developing, improving, and exporting highquality Thai coffee beans to compete in the global market. Fuadi is a Harvard graduate, and if that weren’t impressive enough, he’s currently completing his doctorate in politics at the University of Oxford. The son of late Thai politician Dr. Surin, Fuadi has always been altruistically committed to making a positive social and educational impact. In tandem with a passion for coffee is a sense of patriotism as Fuadi and Beanspire work to develop Thailand as an origin of specialty coffee of which all Thais can be proud. Aim Amarit, alongside his brother and fellow RIS alumnus Charle Charoenphan, co-founded Thailand’s first and largest co-working space HUBBA in Ekamai in 2012. Fast-forward seven years and three additional locations later, HUBBA has now flourished into a complete interconnected network and support system for burgeoning entrepreneurs and startups, thanks in part to a massive partnership with Google for Entrepreneurs. As if that weren’t enough, Aim Amarit is also the co-founder of Techsauce, which recently organized its second hugely successful Techsauce Global Summit conference. The conference is the largest of its kind in Thailand, and the most recent one was attended by an estimated 10,000 delegates. Aukrit, a graduate of MIT, is co-founder of Ricult, a social enterprise recognized by the United Nations and the first of Thai origin to receive funding from the Bill & Melinda Gates Foundation, among other accolades. Through the sharing of innovative technology and digital information, Ricult has assisted farmers in northern Thailand and Pakistan in their agricultural productivity, raising them from the poverty line. Aukrit’s work has garnered him recognition from the Thai government as the top entrepreneur under 35 as Ricult continues to aid Thai farmers not only in the north but throughout the country. IS alumna and film director Bouquet Napussorn Somlit recently visited the RIS Minburi campus on December 20, 2018, to film her latest short, an existential piece about a young woman, Tortun, who believes she is haunted by her late grandmother. Amidst the post-modern scenery of a crowded and buzzing Bangkok, Tortun is “inevitably stuck in time and memory.” Filming took place after hours in the Phoenix gym and at the Phoenix pool, which Bouquet described as “so cinematic” now. Bouquet, currently enrolled at the School of Visual Arts in New York, was also joined on set by her fellow alumni from the Class of 2015, Tah Natpasit Kijkornphan and Numchuem Champrasit, who were actors in the film. The as-yet untitled short film is due for release later this year, and a grateful Bouquet hopes she’ll get to show her latest work to the RIS community. Here are some behind-the-scenes photos, courtesy of Phil Siripatvanich. recently directed a fully staged symphonic version of Andrew Lloyd Webber and Tim Rice’s Jesus Christ Superstar at the Thailand Cultural Center—the first officially licensed Thai production of the classic musical. Somtow’s version of Jesus Christ Superstar has been noted for his casting of three lead actors coming from different religious backgrounds. “[It] seemed to be some kind of sign, showing the world that in this time of dissension and divisiveness in the world, we in Thailand, are able to work together in mutual harmony and love,” he says. “It is a small message from a small country, but it is heartfelt.” Somtow was particularly keen to invite the RIS community to the performances held on February 1 and 2. Because he briefly attended Ruamrudee for two terms in the 60s before continuing his studies in England, it is often overlooked that Somtow is an alumnus of RIS. Some of his earliest writings can even be found in the school’s very first Student Annual, dated 1965–1966, where he is credited as Cookie Sucharitkul. He admits to have drawn from his time at RIS as inspiration for a scene in one of his novels. RIS Photos of the Day: 06/02/19 Today we celebrated our 100th Day of School! As part of the celebration, our ES students participated in special projects and activities, including beautiful artistic posters demonstrating the number 100 in various ways. Congratulations to all the students, teachers, and staff who made it a successful first 100 hundred days! RIS Photos of the Day: 24/01/19 Our HS students recently carried out an experiment that looks at how the boiling point of a mixture of two fully miscible volatile liquids varies as the composition of the mixture alters. Three different mixtures were investigated across two class sections and students collaborated on data collection to interpret the results in terms of the intermolecular attractive forces between the component liquids. RIS Photos of the Day: 23/01/19 Congratulations to our Junior Varsity Girls Basketball Team on taking home the first runner-up trophy at the UNIS Invitational Tournament in Hanoi, Vietnam. Our team defeated ISKL, ISHCMC, and CDNIS â&#x20AC;&#x201C; but unfortunately lost to UNIS in the championship game. congratulations! Ananya Ahuja (Naz), Akaravit Wongwasnasong (Louis), Boonyada Trangadisaikul (Yuyu), Chanamon Pongphaew (Mint), Kantiya Wiwatwanont (Aika), Korranit Khomin (Air), Niranart Pienvichit (Nina), Nutcha Anurakwongsri (Ary), Papichaya Vongthongsri (Beam), Parichamon Promsit (Atom), Parisa Sukheepod (Risa), Piampeetii Poommak (Phet), Pichamin Danwachira (Mint), Puri Chunekamrai (Book), Sirilak Mateekusontan (Pae Pae), Siripa Satianvatidkul (Fang), Thanaphol Bulpakdi (Richy), Tonghatai Aiemsakul (Jointjoy), Treedanuch Treemethawee (Tini), and Vichayaporn Thamnukasetchai (Vint). RUAMRUDEE INTERNATIONAL SCHOOL BANGKOK - PRINCIPLES OF THE PHOENIX IN ACTION!